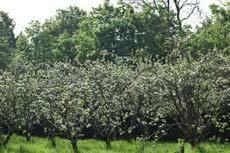 Ownership of part of the West Orchard has today been transferred to Fairfield Parish Council by developers P J Livesey. The transfer completes a promise by the company to give the land to FPC once they received planning permission for housing on the area of land between East Lodge and Fairfield Mews in Eliot Way. The area in question is roughly the visible part of the West Orchard that fronts Hardy Way. It includes the unkempt area between Hardy Way and the entrance to Middlemarch and Fairfield Hall from Eliot Way. FPC will now be able to consider the how best to maintain this land. The remaining part of the West Orchard, the East orchard, the tennis court, the land at the rear of the community center plus other areas are due to be transferred to FPC by the owners Hotbed Investments. Although agreement for the transfer was made last November little progress has been made on the essential legal niceties. But it is hoped that transfer will take place before too long now.